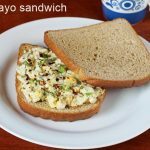 Egg mayo sandwich recipe – Quick and easy egg salad sandwich with video. 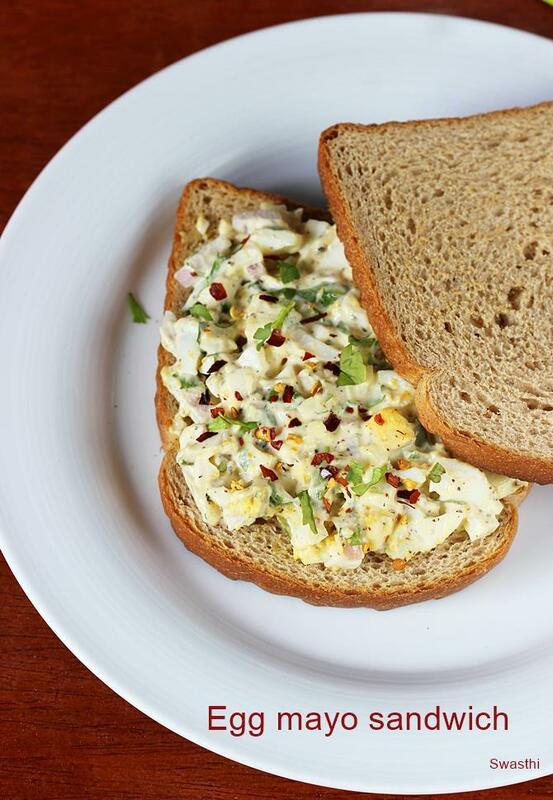 This egg mayo sandwich is surely a time saver on the busy mornings. Within minutes your Breakfast will be ready and it tastes delicious. There are not many ways this is made except for the seasoning and flavoring ingredients which can be altered to suit ones liking. Usually egg mayo sandwich is made without much flavoring, herbs etc. That’s a bit bland for our taste buds, so I use some herbs, garlic, pepper & chili flakes which really enhances the taste and flavor. It is good to consume these sandwiches within 2 hours of preparing as the eggs and mayo are unsafe for consumption after 2 hours unless refrigerated. 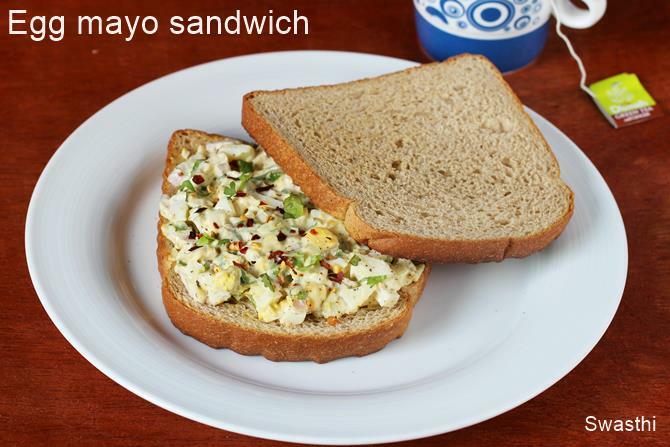 These egg mayo sandwiches are also great for evening snack or meal along with some soup. Egg mayo sandwich is a quick breakfast food that can be whipped up under 10 mins, if you have boiled eggs ready. 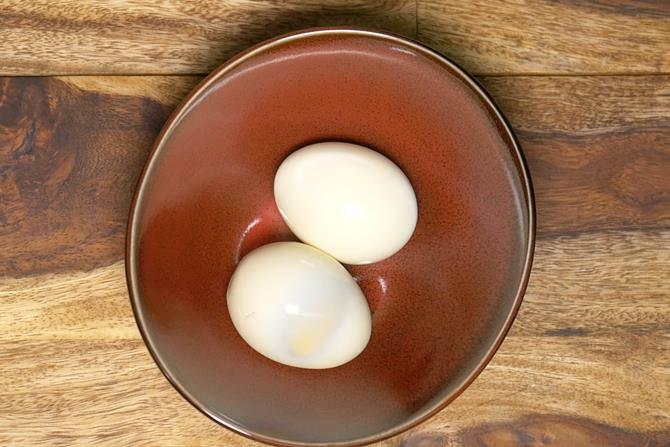 Gently chop boiled eggs to small cubes and add them to a bowl. Add all the rest of the ingredients and gently mix. Taste the mixture and add lemon juice if needed. Toast the bread if you desire. You can toast it on a griddle/ tawa or in a toaster. You can also smear butter on the bread and toast until crisp. 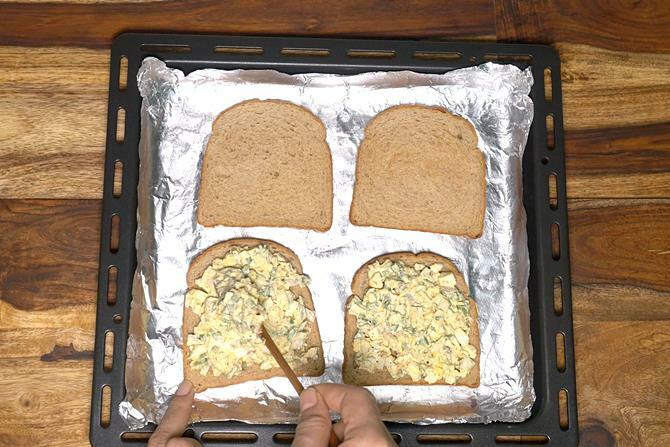 Spread egg salad over the bread slices. Cover with another slice. Serve egg mayo sandwich within 2 hours of preparing or chill in refrigerator. 1. 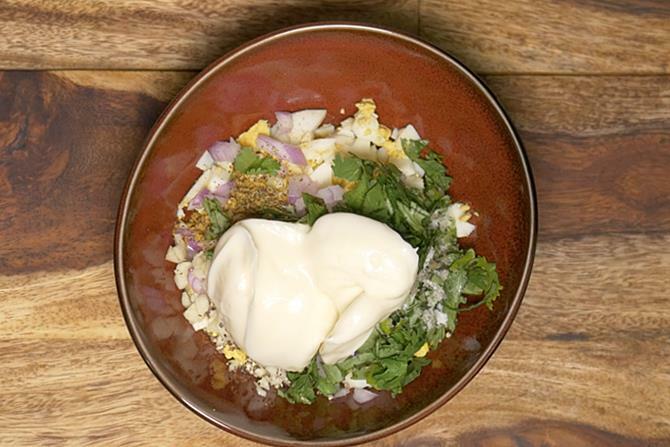 Boil eggs in pot or pressure cooker. Cool them and peel. 2. 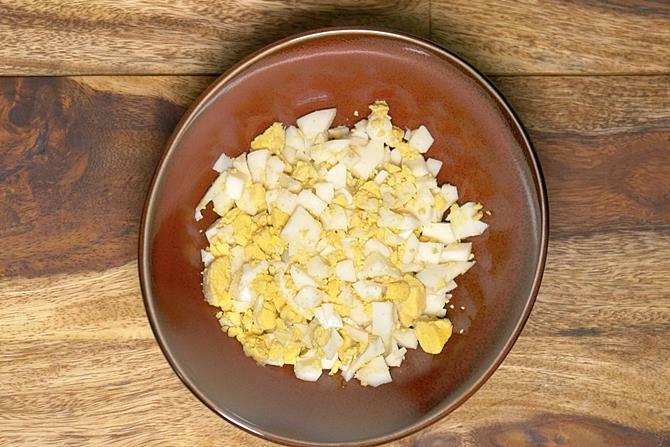 Chop the eggs to small bites without messing up the yolks much. 3. 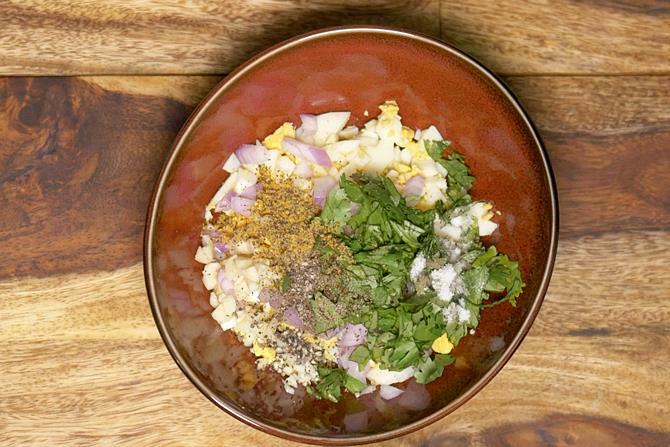 Add finely chopped onion, garlic, pepper, mustard powder or sauce, coriander or parsley and dried herbs if using. If you want to make your own mustard powder, just run a spoon full of seeds in a blender and make a fine powder. Use about 1/8 tsp i.e 2 generous pinches. You can skip onions and garlic. You can also soak them in lemon juice for 20 mins and use. That helps to remove the pungent taste and flavor. 4. Add mayo as desired. I use about 2 heaped tbsps. 5. Mix everything well. Add red chilli flakes. 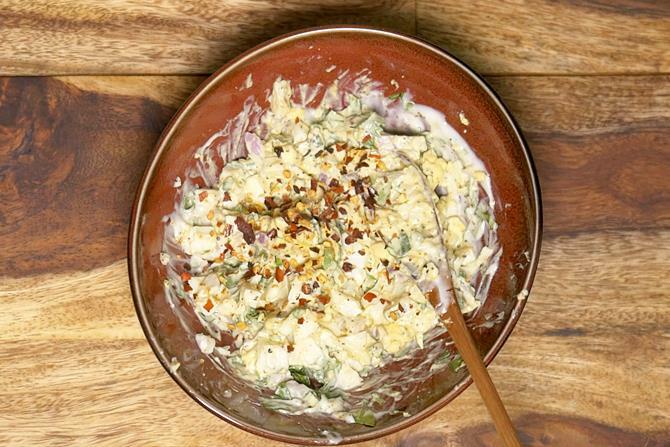 You can add very little salt if needed since mayo is already salted. Taste this and add lemon juice if desired. 6. Spread it on bread. I prefer to toast the bread in preheated oven for 3 to 4 mins at 200 C. You can also toast on a griddle/ tawa. Serve egg mayo sandwich within 2 hours or chill in refrigerator until used.